A player vs player dice rolling game by Eric Lang and Mike Elliot, published by Wizkids. The game of Dice Masters evolved from a game called Quariors. If you ever come across the game the dice and the cards are very similar. 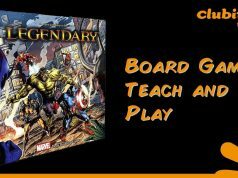 Dice Masters has the advantage of having a theme that many people can relate to, in this case comic book characters. There are other versions of it including Mutant Ninja Turtles, Dungeons and Dragons and War Hammer 40K. You can also mix and games together too. 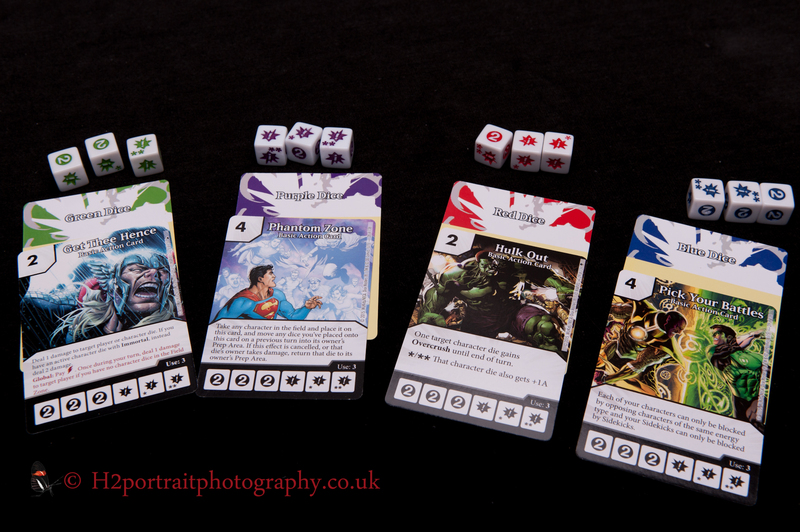 Dice Masters is the only game I know where you can have DC and Marvel characters in the same game. Having collected over a thousand comic books, the theme alone appeals to me. I am not going to go into every detail of the game. It is not that the game is complicated, but it does take a bit to understand when you first start playing it. 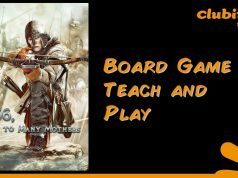 Fortunately, there are a number of videos out there that can teach you the game including the nuances. Here is a brief overview. If you want to field a team based on the Guardians of the Galaxy movie, you can. Before the game begins, each player chooses their team. They can be a mix of heroes and villains from either comic book universe. You can even include equipment or location cards like the Bat Cave or Captain America’s shield. 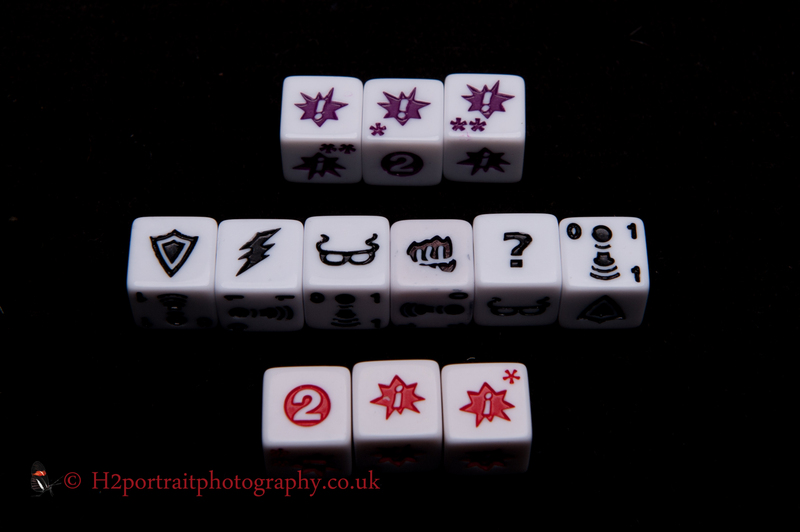 Depending on the type of game you are playing (a quick or tournament style one) you will have a certain number of characters and their corresponding dice. Most characters can have up to four of them (if you have them). These are placed next to the a player’s board. 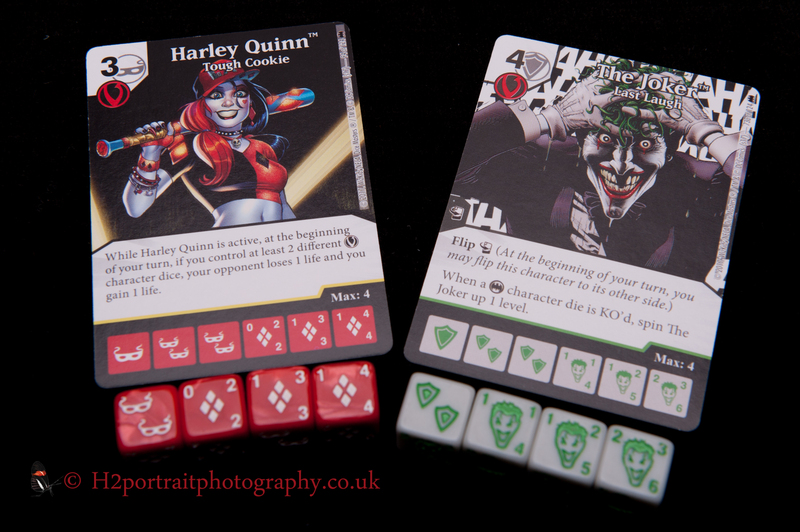 Four sample “Action” cards and the accompanying dice. There are also four ‘action’ cards with three dice on each. These can be selected at random or two by each player. If they are purchased and the dice rolled, they can trigger various powers. These can be purchased by either player during the game and are placed in between them. Two sets of “action” and the core “side-kick” dice. 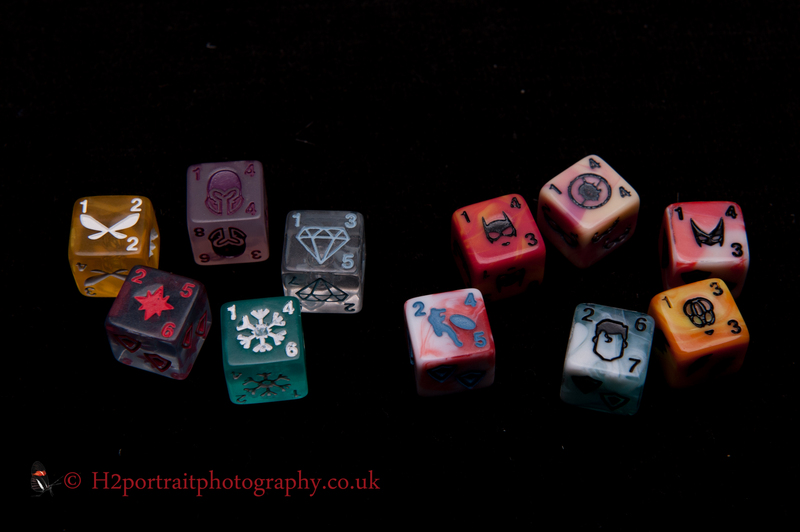 Each player has a bag of eight identical dice called ‘side-kick’ dice. These are placed in a bad and four are drawn and rolled. The player then decides how many they would like to re-roll. Anything from none to all. The players can choose to purchase character from their pool or action dice. Any used dice are played in the ‘used’ area of the board along with any dice purchased. When the bag is empty any dice in the used area is placed back in the bag and four are draw and rolled as previously described. If character dice are rolled and a ‘character face’ appears, they can be placed in the ‘field’ zone of the board if the player can pay the deployment cost in energy. That player can then choose whether to leave them there to protect a player’s life points or attack the opponent. This is where it becomes a little complicated, but it does become clear. Depending on the outcome the dice are moved around the board. Hopefully, you reduced their health. When it reaches zero that player loses. Translucent and marbled dice appear through the sets. There are two real components in the game, the cards and the dice. The dice are custom made and, are for the most part, very pretty. Each one has a different symbol representing their character and can be one colour, marbled or transparent. They are 12mm cubed. Some characters appear in multiple sets. Sometimes they have a different symbol and stats whilst others they are exactly the same except the colour of the dice will vary. If this is the case, you can combine them together. It just looks a bit odd. Some of the transparent dice can be hard to read, but these are rare. 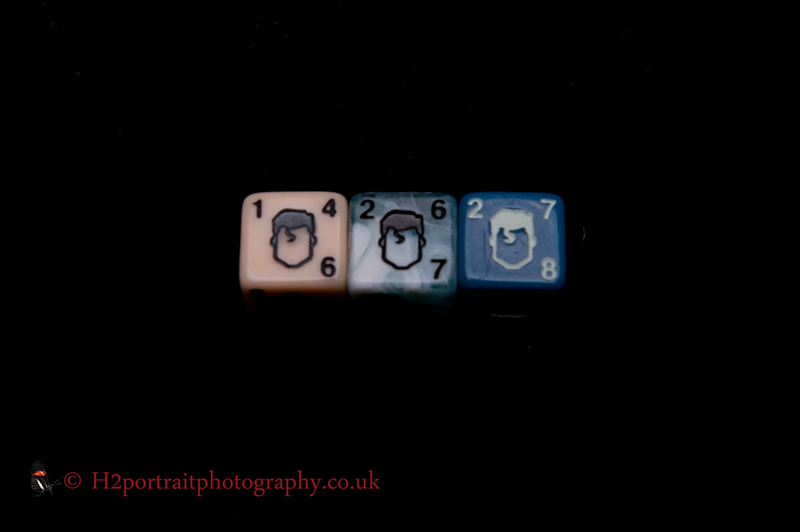 Some of the more popular characters have multiple incarnations with accompanying dice. The cards have art from the comic books. I really like this. Some games employ their own artists and this rarely looks ‘right’ to me as someone who has read over a thousand comics. The cards are made from a decent stock, but there is no linen finish, but is no deal breaker. 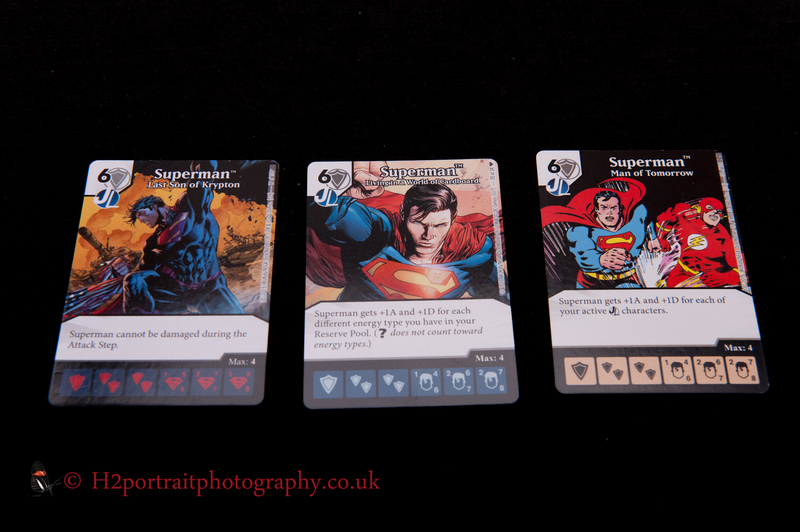 Superman dice from three different sets. They are the same, just different colours. The starter and campaign boxes come with two sets of side-kick dice and two bags. The latter (in more recent editions) are sturdy, but made of paper. Some of them have art work, but it pretty easy to buy or make a couple of dice bags for the game. Both of these boxes will house your game. But in the case of the starter set, you will need to find another way to store your game if you buy expansions or booster packs. The campaign boxes do have room to grow, but not much. There are various third-party storage solutions for the game too. 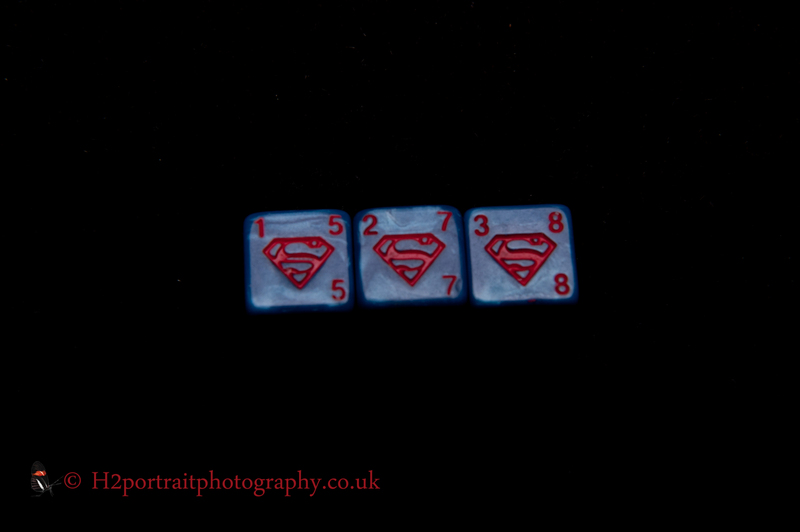 Superman dice from the first incarnation of the Man of Steel. Selecting your team is a large part of this game and can determine whether or not you stand a chance of winning. The game gives you plenty of scope in this regard. You can draft them or develop your own way of doing it as I have. This is a ‘bag-building’ game. The principle is pretty much the same as a deck-builder. There are very few bag-building games around. That is pretty much it when it comes to mechanism. It is does boil down to a very simple game. The rest of it is deciding whether to attack or not. If you do then how many do your troops do you commit? Having said that, there are minor mechanisms at work in the game. Most of them come through the special abilities or powers that some of the characters have. Some of them are triggered if other team members are present. You can create some neat combos if you combine the cards in right fashion. You can mix characters from different universes. Heroes and villians can be in the same team too. The mere fact that there are several flavours of Dice Masters suggests that the theme is weak and perhaps just a veneer. There is a case for this, some of the cards do not have powers and some that do could be tweaked depending on the universe the card is from. Having said that, some of the powers are very thematic. E.g. one of Taskmaster cards can copy the powers from another card. This is what he does in the comics. There are some games that give you the feel that you are playing a character in the game. You can access their abilities, skills and attributes to win the day. Dice Masters does this to an extent, but not a great deal. There is a disconnect between the dice and the actual characters. 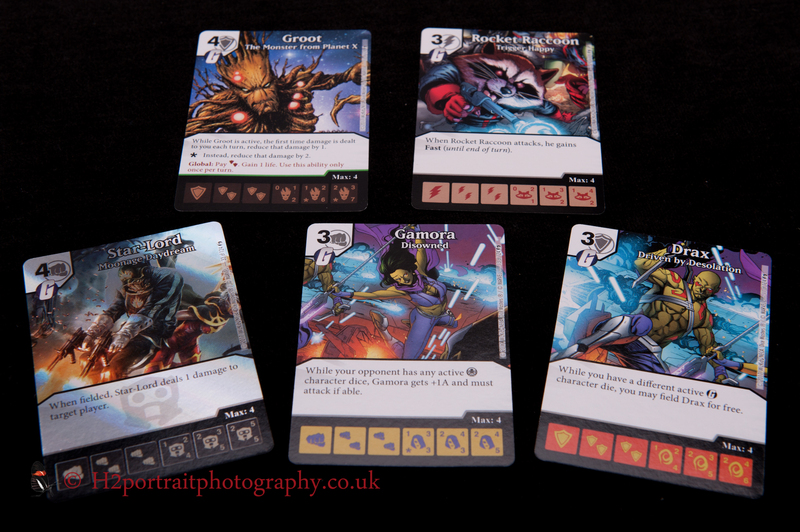 Even with a starter or campaign box there are many combinations and variation that you could play. When you feel the game has lost a bit of shine, then there are options in the form of ‘team’ and booster packs to increase the number of character you can access. 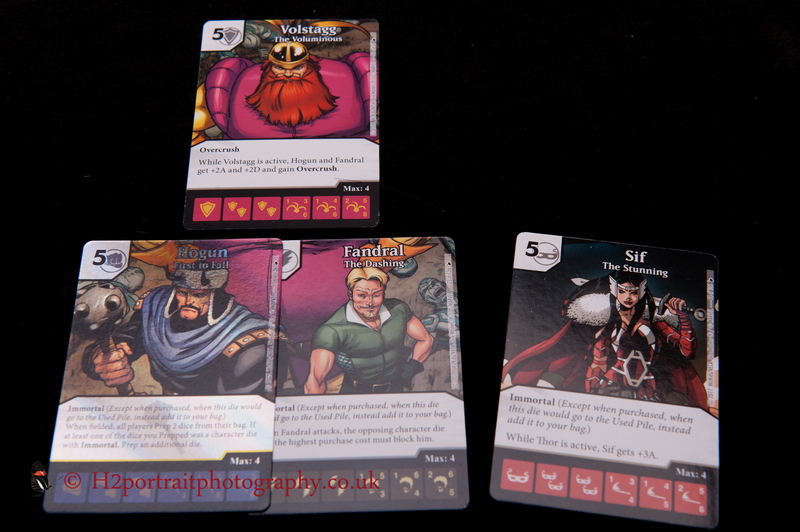 Not to mention different action cards that could swing the outcome of the game in the favour of one player. Unless you enter the tournament scene, there is no need to buy more than you want or need. Using a campaign box as a starting point, you can pad out your collection. It does take a few plays before the combat mechanisms sink in, but the games are so short (on average thirty minutes), it does not take long to play a game or two. Once you have grasped it, it plays smoothly. You can also try to put together a good team of characters too. If you like player vs. player games then I would recommend you look into playing Dice Masters. The games are enjoyable. There is a two vs two version. The teams have a communal ‘prep area’ that allows dice to be moved from one player to another. You can play with one set of cards and dice. Each player does not need their own set. There are many ideas that players have put forth that allow both players to create their team from the same collection. When Dice Masters was sold purely as starter sets with boosters I would have given it a low score in this department. 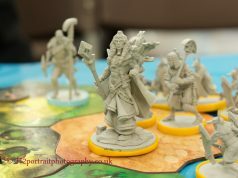 But, the publisher Wizkids, have changed to model and released pre-set campaign boxes and team packs. The packs only have sixteen dice with eight characters. There are three different versions of the same characters in each pack. This means you know what you are buying and there is no randomness. Either way is pretty cost effective although you will end up with too many side-kick and action dice after a while if you buy the campaign boxes and starter packs. If you do buy any boosters the cards can be integrated into the game seamlessly. You may not have many dice, but if you do find a duplicate card, you can still utilise the dice. I have not bought a full price booster pack. I always wait for them to be in the sale and pick them up for less than half-price (50p). You maybe able to tell that I like this game. I do like being able to field characters that I loved from the comics. It is certainly in my top ten games of all time. It is certainly one of my most played player vs. player games. I am aware that it is not everyone’s cup of tea, so give it go and see what you think. Next articleMighty Beanz are BACK for 2019 – this time with Fortnite!